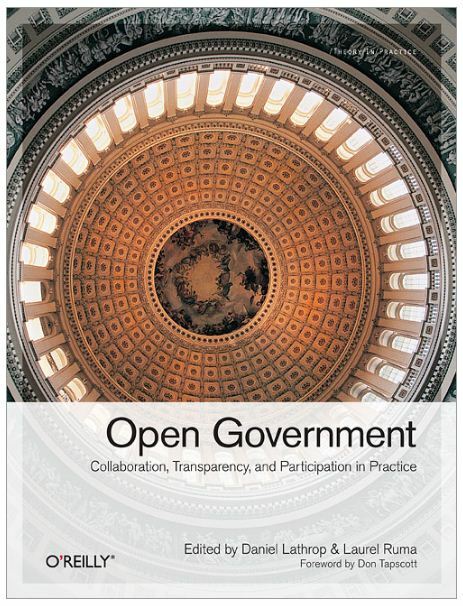 Those of you interested in transparency and “Government 2.0” issues will absolutely want to pick up Open Government: Collaboration, Transparency, and Participation in Practice, a terrific collection of 34 essays edited by Daniel Lathrop and Laurel Ruma. Much like Access Controlled, the collection of essays on global Internet filtering and censorship that I praised here last month, Open Government is a resource like no other in its field. It offers an amazing diversity of viewpoints covering virtual every aspect of the debate over transparency and open government. The book also features interesting essays by my TLF blogging colleagues Jerry Brito and Jim Harper. Jerry’s is creatively-entitled, “All Your Data Are Belong to Us: Liberating Government Data” and Jim’s (along with Jeff Jonas) is on “Open Government: The Privacy Imperative.” Both are worthy of your attention (and I’m not just saying that because they paid me to). I certainly didn’t agree with everything I read in the book. In particular, the chapter on “Open Government and Open Society” by Archon Fung and David Weil troubled me greatly. Fung and Weil make two dangerous arguments that deserve refutation. First, they fear that “the progressive impulse for transparency… may well produce conservative or even reactionary effects of deligitimizing government activity quite broadly as public discourse feeds more and more stories of government waste, corruption, and failure.” (p. 107) Sorry, but for those of us who question Leviathan and consider “waste, corruption, and failure” to be standard operating procedure for government, it’s hard to have much sympathy for this concern. Regardless, they argue that “the solution to this problem is not to reduce government transparency, but rather to create a fuller accounting of it.” They think that will help enlighten the masses and convince them of the many unappreciated benefits of Big Government. More realistically, in my opinion, it will just lead to even more skepticism about the wisdom of expansive State power — and that’s just fine with me, of course. But I wonder what Fung and Weil would recommend if increased transparency goes hand in hand with increased distrust in government? Would their passion for (so-called) “progressive” government trump further transparency it it undermined their desire for expansive State power and action? Not once in the essay — not once — do Fung and Weil stop to reflect upon the core difference between state power and corporate power: the scope of coercive powers and the possibility of escape. That is, the State has the power to tax, fine, punish, imprison, wage war, etc. Corporations have none of these things. And if you hate or fear a certain company, you almost always have another choice to turn to. Not so with the State. Escape from its tentacles is not so easy. They even have the audacity to claim that, “In American society, the threats to citizens individually and to society generally come as much — perhaps much more — from powerful private sector actors as from government.” Really? That’s certainly news to me. Were companies locking up people in Gitmo, storming compounds in Waco, TX, or raiding people’s homes in outrageous drug busts? Uh, no. This is not to say that companies don’t make profound mistakes or that more transparency isn’t a beneficial thing even at the corporate level, but Fung and Weil are engaged in a dangerous game of moral equivalency here that we should not let them get away with. Moreover, they completely ignore the many good reasons why companies shouldn’t be perfectly transparent. Business plans and methods, for example, need to be kept somewhat secret for obvious reasons. Finally, when they make the argument that, “This shift requires the transparency movement to reorient itself in several substantial ways” and asking us to welcome government “as an ally,” they are essentially politicizing the transparency movement and fracturing what, at least so far, has been a very non-partisan affair. If they succeed in leading the movement down their preferred path, it will destroy that alliance. I certainly realize that the majority of people in the transparency and “Govt 2.0” movement do not share my radical pacifism when it comes to the dangers of State power, but I would hope they would want to keep at least some of my type in the movement and maintain a non-partisan approach to the issue. I think transparency and open government advocates should check their ideologies at the door, so to speak, when they approach these issues. Regardless, don’t let my disdain for that particular chapter discourage you from picking up Open Government. (In fact, I think it’s great that the editors included one such extreme chapter in there to give a flavor for what some people at the fringe of the transparency movement are likely thinking.) Overall, this is a terrific set of essays and it deserves a place on your bookshelf if you care about transparency and Government 2.0 issues. P.S. #1: This is probably a “no-duh” recommendation for those of you who already actively follow “Gov 2.0” developments, but for those who are not already aware of Alex Howard and his prodigious and impressive output on this front, start reading him now. Alex is the Government 2.0 Correspondent for O’Reilly Media, and he’s a machine. I’m not sure how he manages to crank out so much material on these issues but he is an indispensable resource and not to be missed. P.S. #2: As always, you find all my book reviews here. Next up: Shirky’s Cognitive Surplus.